bScary? : A couple of parts are very intense and scary, although short. First, let me tell you that “Meet the Robinsons” has nothing at all to do with a Swiss Family Robinson, Robinson Crusoe, or any other Robinson, real or otherwise, to whom you have previously been introduced. Meet the Robinsons is about a boy named Louis who has been raised in an orphanage since being abandoned on the doorstep as an infant. When the movie opens, he is about twelve years old, and is the quintessential science geek boy, and always inventing things. He is essentially unadoptable not because of being older, but because none of the prospective parents appreciate his creative inventions. What he wants to invent most of all is a machine that will retrieve memories, so that he can retrieve his own infant memory of what his mother looked like, so he can find her. When he does invent such a machine, it falls into the hands of the villain (“Bowler Hat Man” – yes, that’s really his name), while in the meantime Louis finds himself visited by a boy from the future, and ends up accompanying the boy back to the boy’s time in the future. Here he meets the boy’s whacky family – the Robinsons. While the villain is about the most inept villain in the history of villains – he’s something of a cross between Snidely Whiplash and Alice from the Vicar of Dibley, there is still a fair amount of things that we would have preferred our son not be exposed to. The villain constantly is trying to abduct Louis, and in one scene Louis’ roommate from the orphanage is beat up by his Little League teammates for falling asleep in the outfield and not catching the ball. In addition, there is a very scary scene where an army of bowler hats take over the world and basically turn it into the haberdashery version of 1984, with the head bowler hat and an army of minions coming straight at Louis. Also, a dinosaur that is transported from the past to help Bowler Hat Guy capture Louis is vanquished by being attacked – while not with standard weapons – with things such as giant pizza dough, the effect is still the same (he isn’t hurt, just subdued, and then he becomes a pet). During one of the meal scenes with the Robinson family, a food fight breaks out that includes a scene that one thinks is about to turn into a Kung Fu bloodbath, although it doesn’t. Then there’s the whole matter of watching a mom abandon her infant at an orphanage door (that’s the opening scene), and of a child being unable to be adopted. All of this may be fine for older kids, but it wasn’t what we wanted for our 9-year-old, and most (not all, but most) of it was completely unnecessary to the story. That said, it has an awesome feel good ending, and I actually applauded at the end (and not because it was over) both times I saw it. And our son loved it. There was also a lot of humour that is aimed straight at the adults – not that it was adult themed – but that it was stuff that will be funny to adults but go right over the kids’ heads (ala Rocky & Bullwinkle). But I would have been much happier with it without those unnecessarily inappropriate scenes. 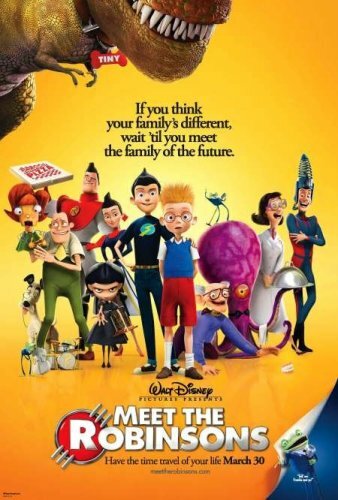 In fact, while Meet the Robinsons is rated ‘G’, I have no idea how they got away with that; it definitely should have been PG, at least, in my estimation.